Cacao, Honey and Figs Oh My! Raw truffles!! Recipes to come, but gearing up for a great night in Baltimore at the Black Olive! Raw 5 course dinner and one of them includes the lovely confections I just made pictured here! Looking forward to a great night with Woody Harrelson! We will see if we can match up to the awesome New York weekend we just had with him and David Blane! I think we should give salads a new name. I think they have a bad wrap with the magority of people out there. Just the word implies a very non-creative execution of some dry combination of lettuce, carrots and tomatoes. Maybe the adventurous might include red onion and cucumber in that image too. But no one is excited about that. In fact, I think the only reason anyone gives it any belly time at all is because they are under the impression that one of those every few days will provide the healthy balance they need to an otherwise un-colorful diet. But any clean, plant based eater knows, there’s a whole world of salads out there–colorful, hearty, full of grains, nuts, seeds… in fact, truth be told, when I make a salad for myself, the greens probably play the smallest part! So what can we call these? I mean, they are full meals–not the appetizer the name salad suggests. They are multi-layered, multi-textured, and multi-colored. Not monotonous like the name ssalad suggests. I’m reminded of another conversation I had with client yesterday who has had amazing health and body results from a dietary lifestyle change, most measureable by the integration of complex sweets to his diet throughout the day–fruit, figs, prunes, dates, etc. Also, the creme de la creme for him has been the integration of RAW desserts. After talking through the immense, varied and full body benefits that his body receives when combining cacao, coconut, honey, avocado and nuts into one delicious dessert, he asked: “Should we even call it dessert? It does our bodies good like a meal would, it has the full host of nutrients we need…we should give it another name!” Yes. We. Should. Like salads, raw chocolate desserts should absolutely never be confused with whatever slimy chocolate concoctions on popular dessert menu’s! I digress. So I had a delicious salad (for lack of better word, yet) for lunch today that I thought I would share with you all! Sprouted Quinoa: Soak about a cup of quinoa in enough water that it covers all the way for 24 hours, rinsing twice. Drain. Transfer to a tray of bowl big enough so that you get a single(ish) layer of quinoa, and sprout for 1-2 days (depending on freshness), rinsing 2x per day. 1 c or so of arugula–pre-toss with a little EVOO, braggs and lemon juice–only enough to get the leaves shiny! Mix it all toegther! Enjoy!! Carrot Cake Cupcakes! Life, Death & Life Again. Fact: A raw foodist CAN have carrot cake! Fact: A raw foodist CAN have cream cheese frosting! 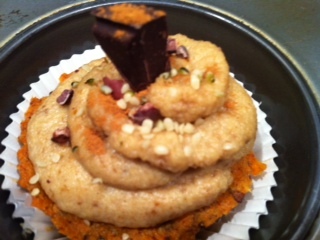 Fact: A raw foodist CAN eat an actual cupcake that you have to pell the wrapper away from! And my favorite fact of all. I remember so fondly the times when my mom would make her famous carrot cakes. Quite ahead of her time I must say, and very rustic…hand grating all the carrots, using half the sugar, and maybe even whole grain flour…but after she’d put it in to bake, me standing there, licking the batter off the spoon, and THEN…oh, and then…using my fingers to wipe clean the bowl. So I thought that moment of nostalgia would forever be in my past until last night… FACT: Raw foodists CAN lick the batter bowl clean. To boot, we don’t even have to worry about salmonella! So I did it! I made what I am told are delicious carrot cake cupcakes. It was a bit arduous, so much so that I didn’t even realize that I was making them to the beat of my own drum–I didn’t have the tv or radio on at all. And even though I’ve really stopped watching tv, I do like to have some background chatter while I’m making food. Of course, there were the typical “Jinji, really?” moments. 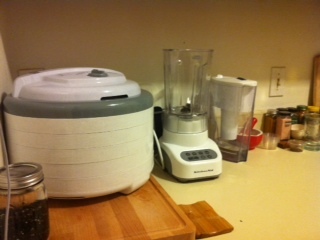 First, I need a bigger food processor. The little kitchenaid dealie isn’t going to cut it anymore! I found myself ridiculously working in batches with 6 cupcakes worth of batter. Next, I’m learning there are rules to baking. Like, mix some ingredients first, then add the others. With cooking, you can have flexibility…do what feels right. But not with caking! (caking, because it’s not really baking, is it?) But the carrot shreds in too early, causing great upset to my dates and walnuts, and the happy goo they were trying to create together. So, stop take out the shreds that hadn’t interrupted and continue. Stop, remove have the 1/2 done goo because of small container, continue. Did I add the spices? Should I?? Continue. I mean that’s a good 30 minutes of un-do and re-do and a big mess! But finally in spite of myself, I came out with a batch of frosting, and the lovely batch of batter pictured below–shoved into silicone cupcake holders (both the shoving and the silicone was actually pretty brilliant. After they refrigerated for a while, I got nice densely packed uniform cupcakes that were super easy to remove!). And, once I got half a brain and stopped trying to carve out perfect swirls of icing, like how it looks like in pictures, I put all the frosting in a ziploc bag and clipped the corner to pipe it out. I’ve since learned that everyone knows to do that, but at the time I thought it was a stroke of pure genius. So everything cooled out in the fridge for a while as I basked in all my newfound carrot wisdom. FACT: A rawfoodist CAN safely. literally, and relatively guiltlessly eat both the frosting and the batter with his/her finger before they even get the chance to make contact. Sigh. Oh! And a joke: You know you’re a raw foodist when “how long does it have to go in for?” refers to refrigeration, not baking in the oven! Hilarious, I know, I know. Process the walnuts and dates until they’re like a larabar consistency. Add in carrots until everything is well combined. Then, add everything else. 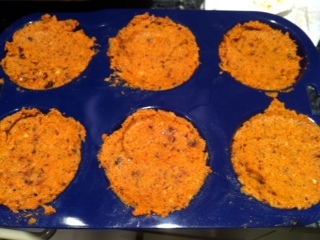 Put into a silicone cupcake tray. Refrigerate for an hour or so. Done. 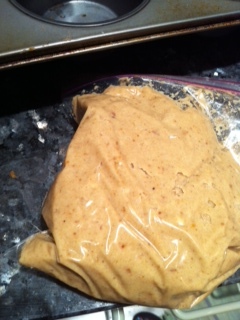 Process everything together, adding water as needed to get it to frosting consistency. Spoon into a ziploc. Refrigerate for the remainder of the time the cakes are getting cool. “Pop-out” the cupcakes, then pipe! 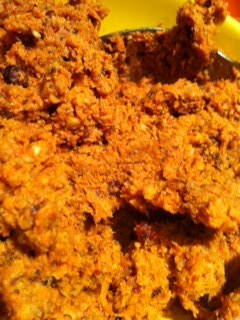 Then top with hemp seeds, cacao nibs, cacao…coconut shreds, cinnamon. ENJOYYYY!!! These are GOOOOD! Ok. So here’s the picture of it. and don’t get me wrong. I’m Raw, not Dead…it looks sort of good. But honestly, not to me, it really doesnt, but I can see how someone, even a clean someone would say “mmmm”. Ok, I said that, so now I can say this: “Burger King. REALLY??? Have you not killed enough people by way of Whoppers already?? 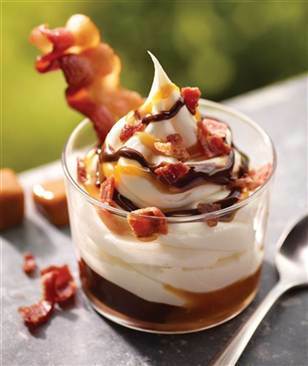 You had to go and make a Bacon freakin Sundae to go with it? ?” Okay. Relax. I know I should, and I know people make their own choices. BUT! WHy, oh why does American Fast Food continue to make it so damned hard to do the right thing? Check these numbers. If, just say someone went and decided to get their usual Whopper meal–A Whopper, Fries and a Coke (BTW, was just on the BK website to find out this information, and learned they now have such a thing as a TRIPLE whopper….lonnnng sigh). Say they then decide that since they left the bacon off the burger, they have license to also go ahead with this Sundae/Bacon concotion pictured above. Because, well they would have gotten ice cream anyway. Well the Whopper meal itself already puts them back 1,560 calories. Add the Sundae, and in one sitting, they will have consumed 2,070 calories. But wait, it’s 173 grams of sugar total!! Where’s the bold button on here…173 grams of sugar!!! And taking into account our nifty equation (thanks Lil Sis! ), that’s a staggering 43 teaspoons of sugar. In one sitting. At one time. In one body. And we wonder why we can’t get a hold of ourselves. I can’t even imagine how long it would take to recover from 43 tsps of sugar. I’m reminded of that Smoking movie where the lead character was kidnapped into a cargo van and literally injected with nicotine until near death. Dramatic? Maybe. But maybe not. Blend and add in the chunks of salted cacao, plus hemp seeds and blueberries. Mmmmmmm! Now that I am coherent, and it’s not 3:00a in the morning! So we ended up getting back to Baltimore around 4:00a last night. Number one benefit of living Raw…ENERGY! Our Baltimore Party of Five was zonked, but we were still alive! Still buzzing about the unblievable experience we had just had, and still marveling over the delicious food that was in our bellies! Can I say that Pure Food and Wine is America’s Raw hotspot? Is that debateable by anyone? I have been to enough raw restaurants in other states to really say that unequivocally, but I just can’t imagine there being any place that could beat it! However, if there is, that’s fantastic, and I am booking a ticket today to go and eat there! I mean avocado stuffed squash blossoms in a strawberry rhubarb broth! King trumpet mushrooms done RIGHT…enchiladas and tacos you wouldn’t believe, cauliflower couscous spiked with with mint, and this savory, delicate puree of a soup with a nut creme drizzle that made Woody Harrelson who had declared he was fasting for the evening, break fast and join the delicious festvities! I’m afraid if I even go into the desserts too much I’ll drool on my keyboard. But let’s put it like this…creme brulee, cacao ganache with a fluffy, airy cacao mousse inside, and ginger blackberry cheesecake. Yes. That happened. Talk about inspiration! So we have our Raw food Happy Hour and our own sit down Chef’s dinner this Saturday night, and we’re pulling ALL the stops too! 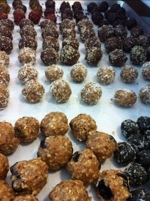 Definitely have a delicious line up for the menu, filled with superfoods, and other dishes of yummy intrigue. I can’t wait! WIsh you all could come! We’ve also managed to line up a few more special guests, so it’s definitely going to be a night to remember! Not to be outdone, the next mornng will be our wake up with Vinyasa (taught by famed Phili instructors Dhyana and John Vitarelli! 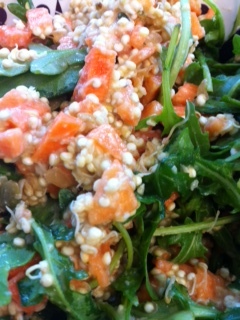 ), followed by our open juice bar and delicious raw brunch items! Just had an amazing Raw food experience! So it wound up being about 12 of us, but definitely including my new core raw group from Baltimore. We started at Organic Avenue and finished the night at Pure Food and Wine, the raw Mecca of the east coast. Wow! Organic Avenue is a super cool place. The beautiful display of juices, shots, elixirs combined with a packaged raw food collection more extensive than any I have ever seen! Which, for me–She who equates health food stores to paradise–Was extra special! And BIG shout to Zia’s, one of only a couple raw food hotspots in Baltimore…Organic Avenue, in the NYC big city that never sleeps (affirmative, as I write this post at 1:00a amid a city still buzzing around us!) actually carries their goods! Imagine that, Zia’s from little Baltimore! Anyway, after grabbing a bunch of yummy things, we headed to Pure Food and Wine at 17th and Irving where we had the five course Chef’s Table tasting. AH-MAZING. Inventive. Creative. Intentional and obviously made with a ton of love! So thank you NYC. A short trip and delicious indeed. Oh and of the additional new friends we ate with… David Blane and Woody Harrelson! Crazy! Sorry Brad! There’s a New Chip in Town! Step one: Don’t Peel. Stare the veggie in the eye (or nub), and commit to not peeling it. Step two: Get out the mandoline, and slice away. Pick a thickness that makes sense to you, and stick with it. Consistency is key! Sprinkle with seasonings. Make it spicy, or cheesy with nutritional yeast. Less is sort of more. I think I went overboard, but they are still delicious! Dehydrate for a long time. Literally, these took 24 hours! It’s ok to check on them, you won’t ruin the process. When they’re finished, if you don’t house them all in one sitting (you might! ), let them cool for about 5 minutes. MOST IMPORTANT if you want to impress friends the next day, and enjoy crispy chips with your lunch, store in an absolutely air tight container. Don’t be that person that gets people all excited only to find out they aren’t like they were the night before. Fail! Limp “chips”. Preventable. Air-tight container! 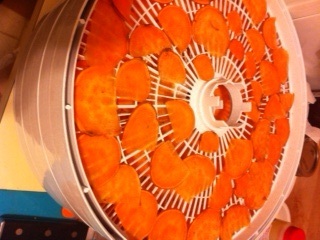 So the dehydrator and I are officially friends now. I’m planning on making some breads soon. Maybe a pizza. Maybe I’ll warm my morning Manna bread in it. Maybe I’ll warm up some stuffed portabella’s. Endless! In fact, we’re SUCH great friends, that I have officially r eplaced an old, dear friend of mine. One that has stood by me, and been quite useful in times of desperation. But I’ve known for some time, that this friend was no good for me…the good ole poisonous Microwave. Gone. Took a knee under the counter. I officially have a raw kitchen! Working on getting another juicer now. The old one I have holds too much juice in the pulp. Any suggestions?? …It’s the most wonderful time of the year! (Yes, to be sung in key of popular Holiday carol) It’s officially summer time! Hot weather, long days, summer swim nostalgia, SUN, windows down, music up…not to mention all the colorful fruits! I can hardly contain myself! So I won’t…it’s time for raw! And this solstice, unlike my Spring RAW solstice experiment, I am ready to charge full steam ahead. 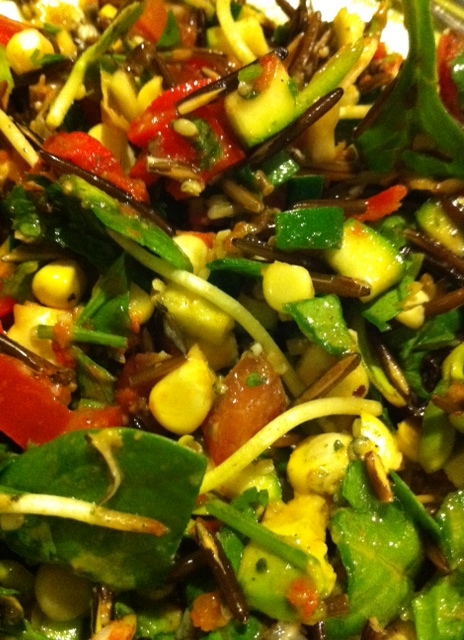 In the Spring, my 2 week raw food experiment was filled with delicious things, success, failure, battles, wars, compromises, excitement, discovery and fun. But I didn’t know what I was getting into, and I didn’t knwo what each day would look like or taste like for that matter! In fact, this morning, as I was making my commitment to myself to be all raw, I giggled at all the time prepping I spent for the Spring raw. I made day plan menus, I googled, I made inquiries, I got books and appliances…it was cute really. But now, still far from being a pro, and much inspired by those who are, I am a little more seasoned having held on to about 80% of the raw lifestyle. I’ve learned shortcuts, new recipes, and have great resources. MOST exciting…I’m not afraid. Of the appliances I got last time, is my nemisis. It has shamed me for months now as it has stared at me unused! Somehow I reasoned with myself, I should keep it, even if on the high shelf, but I never could bring myself to actually use it. THE DEHYDRATOR. I know, I know. What’s the big deal. Well I can’t answer that, but I know the intimidation of actually embarking on that level of raw has been overhelming. Until…. Yup! 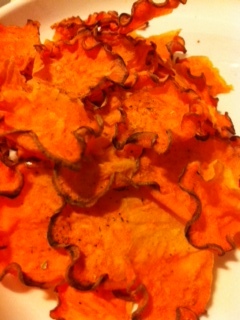 Sweet potato chips! No big deal :). pliable. Not quite chips. But did they really need another 8 hours? Sigh. Battle one. Waged, afterall. Stay tuned! I will share the spice concoction when and if I ever get to enjoy one of these bad boys!